Advertisements show that Lancelot, and later his sons Richard and Thomas, were proud of the imported exotic food they could supply. She dined upon bacon, and supped on grey peas. The lines are from the poem ‘The Country Mouse and the City Mouse’, written by Richard Scrafton Sharpe, yes indeed, our grocer. 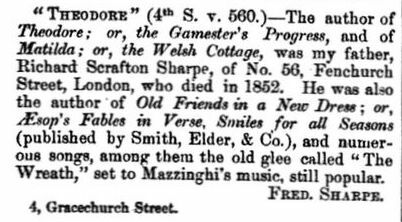 It was derived from one of Aesop’s Fables (see here) and was one of the poems in Sharpe’s collection of Old Friends in a New Dress which his son Frederick lists as being definitely written by his father. He mentions a few more titles in reply to a query in Notes and Queries by R. Inglis who wanted to know who had written Theodore and Matilda. 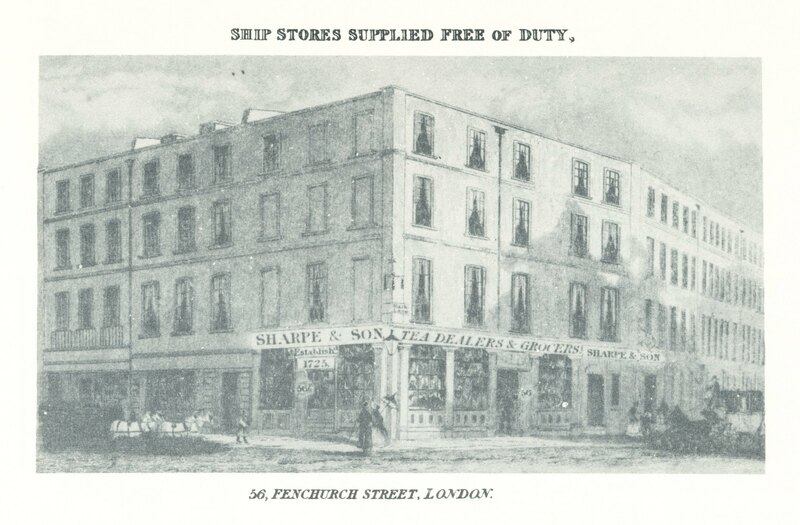 (7) Fortunately for this post, Frederick adds his address on the bottom of his reply, 4 Gracechurch Street, thereby not only confirming the authorship of his father, but also his own address after the shop in 56 Fenchurch Street was demolished. 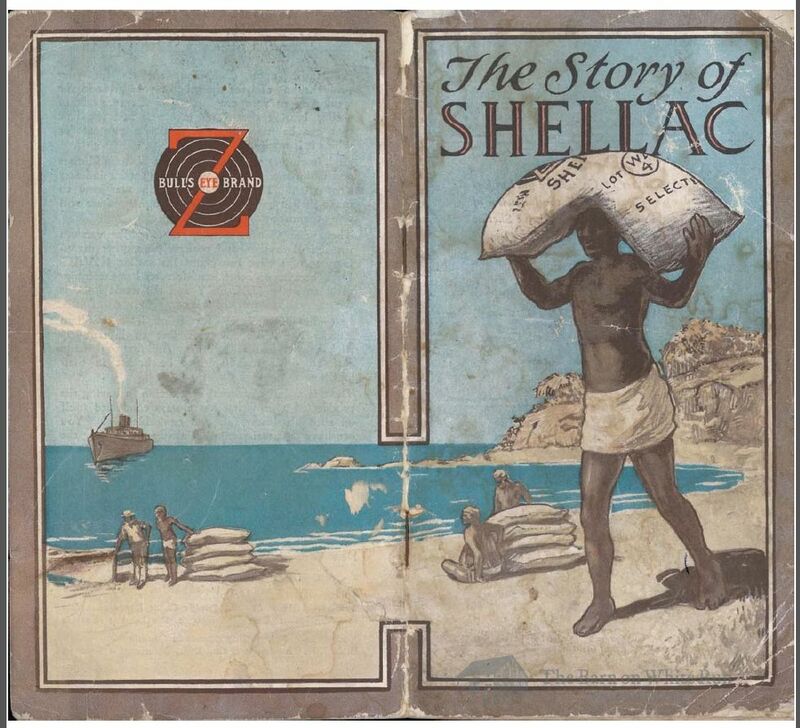 The family business therefore existed for some 125 years in Fenchurch Street and afterwards for roughly another 25 years in Gracechurch Street. Not bad! (2) The Orthodox Churchman’s Magazine, February 1802. 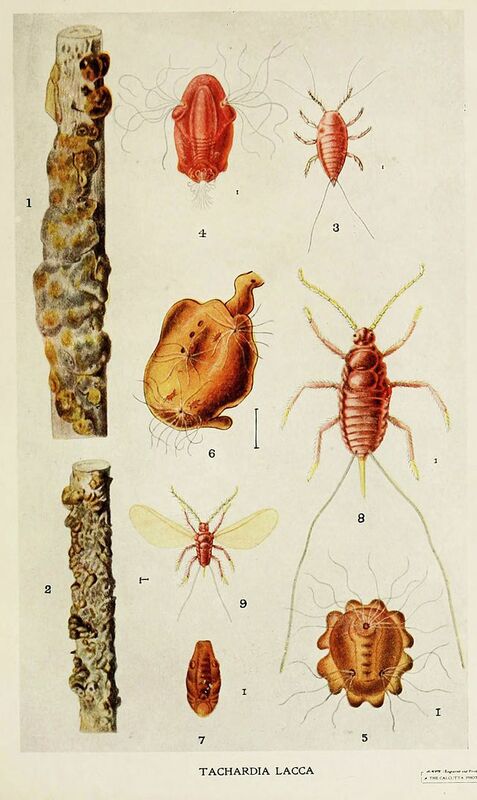 The grandson of the reverend, Richard Bowdler Sharpe became a famous zoologist, see here. (3) PROB 11/1517/14. Charles later went to Dublin and used 56 Fenchurch Street as the address where his catalogues could be obtained. 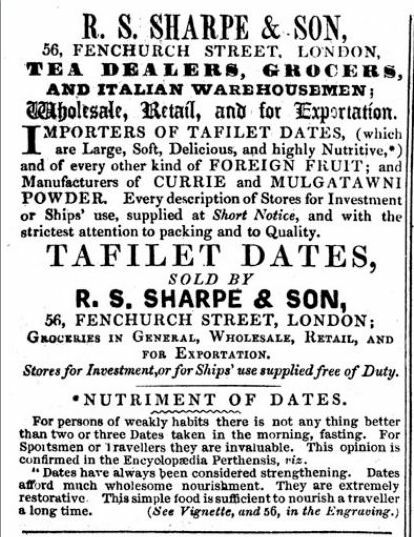 For instance: advertisement in Freeman’s Journal and Daily Commercial Advertiser, 23 August 1843. (4) Old Bailey case t18220220-66. (5) The London Gazette, 30 September 1831. 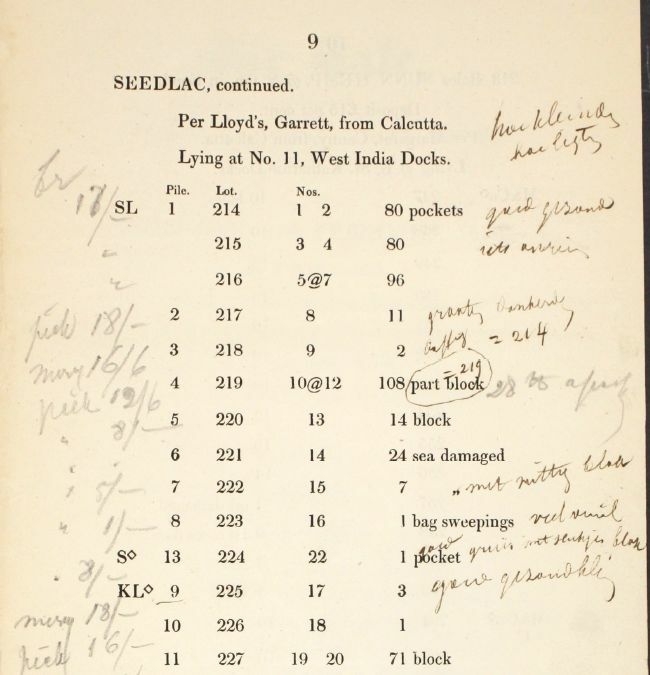 (7) Notes and Queries, 4th Ser., v.5 (June 1870), p. 560; and Idem, 4th Ser., v.6 (July 1870), p. 16. In 1826, Christopher Gullett Millman (also Milman), the son of William Millman, coal merchant at Plymouth, was taken on as an apprentice by Thomas Broomhall of Swan Lane, Upper Thames Street, indigo and drug broker. Broomhall died in July 1828 and his executors agreed to turn Millman over to Thomas Etherington of Cannon Street, dry-salter, for the rest of his term. Daniel Defoe described a dry-salter as a trader in “salt-peter, indico, shumach, gauls, logwood, fustick, brasileto &c”(1). 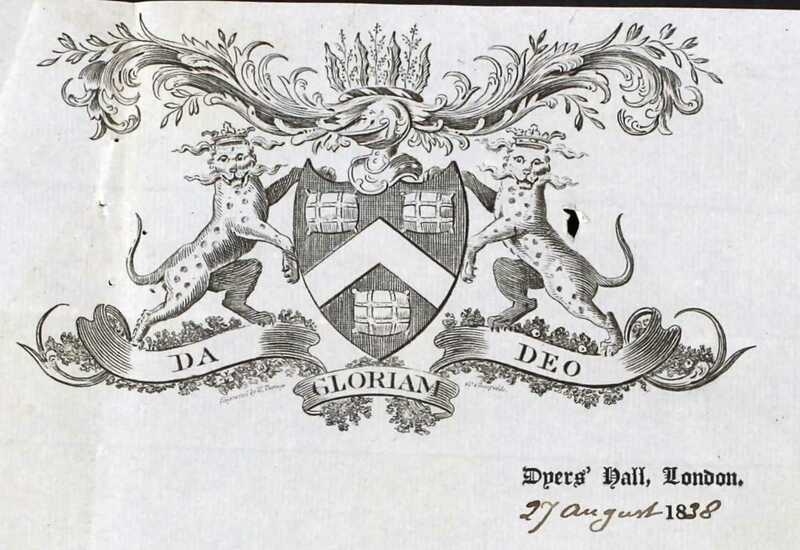 Both Broomhall and Etherington were members of the Company of Dyers and in 1838, Millman received the freedom of that Company. Millman became a partner in the firm of Andrew Johnson and David Henry Renny, brokers at 57 Fenchurch Street since at least 1834. We would not have known much more of Johnson, Renny & Millman if one of their sale catalogues had not been kept in a Dutch archive (the Internationaal Instituut voor Sociale Geschiedenis / International Institute of Social History, Amsterdam, shelfmark 474: 4.3.1.17). 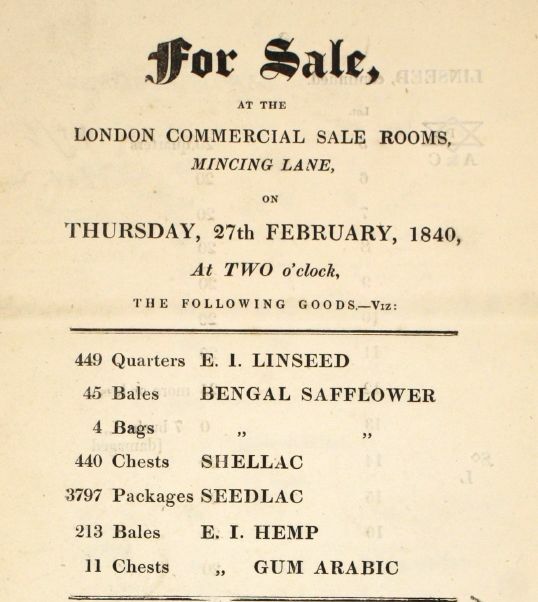 This 10-page catalogue announces the sale of products that the firm had for sale on 27 February, 1840, at the sale room in Mincing Lane. The copy of the catalogue in the archive is annotated in different hands, but the one who made the notes on the right-hand side of the paper in ink was certainly a Dutchman. I cannot decipher everything he has written, but certain words are legible, such as oranje [orange], hobbelig [bumby], gruis [grit], helder [clear], donker bruin [dark brown], and fijn stof [fine dust] and are definitely Dutch. 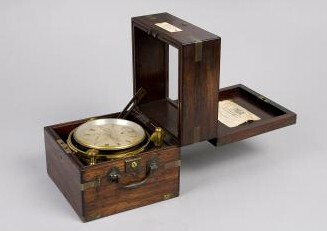 Millman’s partnership with Johnson and Renny did not last very long; on 2 April 1841 it was announced in the London Gazette that Millman was to retire and Johnson and Renny were to continue the business. 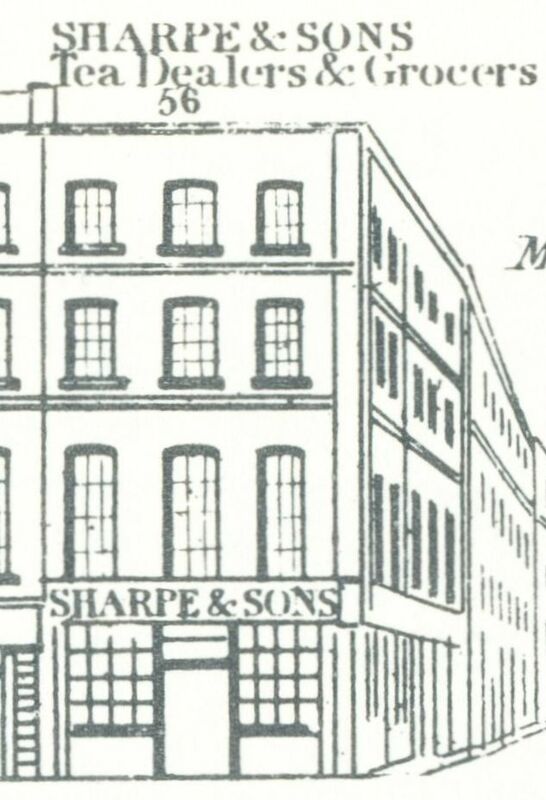 In 1850, the two remaining partners, by then trading from 11 Great Tower Street, split up. (4) Johnson remained in Great Tower Street and we still find him there in 1864, when “Andrew Johnson and Co, brokers” announce the sale of 217 bags of cochineal. (5) In that same newspaper we find an advertisement for “Renny, Anderson and Co, brokers” of 37 Mincing Lane offering 60 bags of cochineal and 30 bales of safflower. 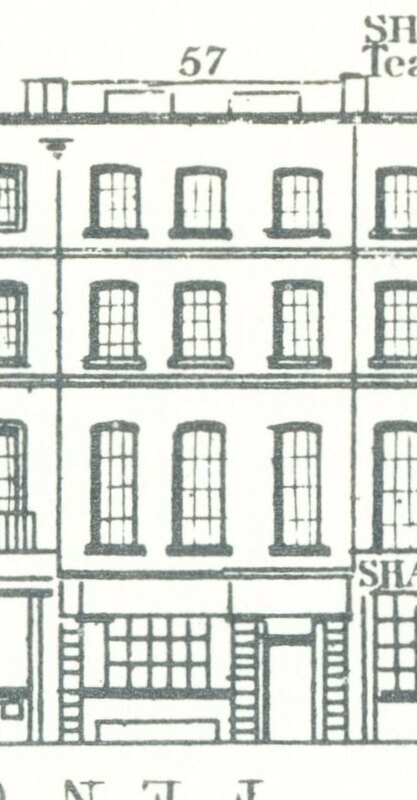 That this Renny is the same Renny as the one in partnership with Johnson and Millman can be seen from the notice about his retirement from this later partnership in 1877. The notice in the London Gazette of 13 March 1877 explicitly states that it is David Henry Renny who retires. He dies in 1880 at 1 Argyll Road, Kensington and was buried at Norwood Cemetery. His probate entry(6) mentions two executors, one of whom is Thomas Hardwick Cowie, Renny’s nephew. The Cowie family, although not Thomas himself, had been visiting the Renny family at the time of the 1851 census when Renny lived at Crown Hill, Lambeth. It would have been nice if more information had been found on the third partner Johnson, but alas, I have not managed to work out which of the many Edward Johnson’s fits the bill. (1) Daniel Defoe, The Compleat English Tradesman, volume 2 (1727), p. 23-24. 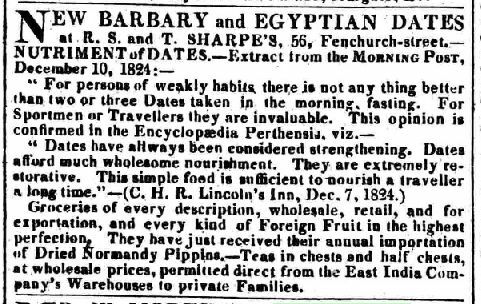 (4) London Gazette, 1 January 1850. 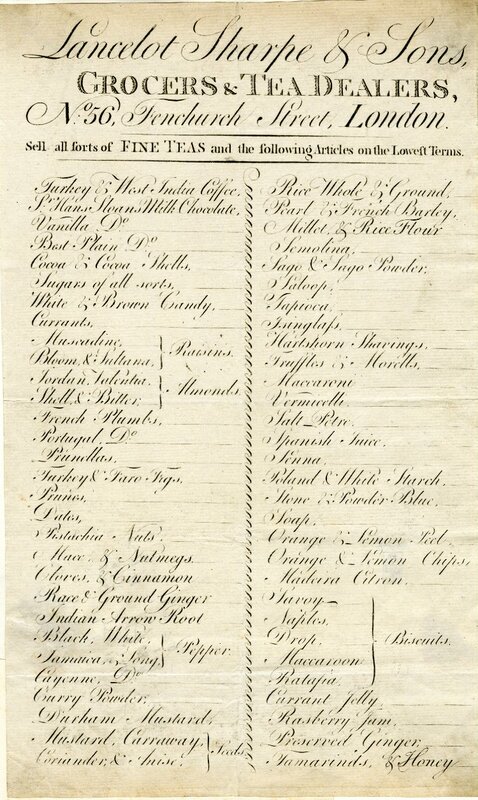 (5) Commercial Daily List, 8 November 1864. (6) England & Wales, National Probate Calendar (Index of Wills and Administrations), 1880. Estate valued at under £6,000.